“On April 16th, 1863, 20 years later, in the speech in which he introduced his Budget [sc. Gladstone said]: ‘From 1842 to 1852 the taxable income of the country increased by 6 per cent In the 8 years from 1853 to 1861 it had increased from the basis taken in 1853 by 20 per cent! The fact is so astonishing as to be almost incredible .... this intoxicating augmentation of wealth and power .... entirely confined to classes of property .... must be of indirect benefit to the labouring population, because it cheapens the commodities of general consumption. While the rich have been growing richer, the poor have been growing less poor. At any-rate, whether the extremes of poverty are less, I do not presume to say.’ How lame an anti-climax! If the working-class has remained ‘poor,’ only ‘less poor’ in proportion as it produces for the wealthy class ‘an intoxicating augmentation of wealth and power,’ then it has remained relatively just as poor. If the extremes of poverty have not lessened, they have increased, because the extremes of wealth have.” (Marx 1906: 715–716). In this subsection of section 5 of Chapter 25 of volume 1 of Capital, Marx attempts to prove by various statistics that the British working classes remained in poverty down to 1867 despite the soaring wealth produced by capitalism. This is the whole point of his quotation of Gladstone. The full text of what Gladstone said has been preserved in newspaper reports of the time and in the parliamentary Hansard (which would have been edited by Gladstone to some extent). “The Income tax at 7d. in the pound, in 1842, attaching to Great Britain only, and only to incomes above £150, was assessed upon an amount of income reaching £156,000,000.— Upon the very same area, with the same limitations, in 1861, the amount of assessed income was £221,000,000, the difference amounts to no less than £65,000,000 of annual income, or two sevenths of the whole taxable income of the country in the same area described. * That is a most remarkable result, but there is a feature of that result, which when carefully examined is yet more remarkable; and that is the accelerated rate of increase in the in the last year. I compare the two periods before 1853 and since 1853, when the basis was altered. In ten years from 1842 to 1852 inclusive, the taxable income of the country increased by 6 per cent, but in eight years from 1853 to 1861 the increase of the country increased from the basis taken, by 20 per cent. That is a fact so strange, as to be almost incredible. If I may presume to suggest a cause, I would suggest two—first of all, the enormous constant rapid development of mechanical power, saving human labour, and the extention of machinery; but that has been in operation for the last hundred years, extending on all hands the economy of labour, the real and new cause that has been in operation, has been the legislation of Parliament setting free the industry and intelligence of the British people, I must say for one, I should look almost with apprehension and with pain upon this intoxicating augmentation of wealth and power, if it were my belief that it was confined to the classes who are in easy circumstances. This takes no cognizance at all of the condition of the labouring population. The augmentation I have described, and which is founded, I think, upon accurate returns, is an augmentation entirely confined to the classes possessed of property. Now the augmentation of capital is of indirect benefit to the labourers, because it cheapens the commodity which, in the business of production, comes into direct competition with labour. But we have the profound, and I must say, the inestimable consolation, that while the rich are growing richer, the poor have been growing less poor. Whether the extremes of poverty are less extreme than they were, I do not presume to say, but the average condition of the British labourer we have the happiness to know, has improved during the last twenty years in a degree we know to be extraordinary, and which we may almost pronounce to be unexampled in the history of any country in any age. That is a result upon which we are entitled to look with the greatest satisfaction, and with the greatest happiness; because, after all let us recollect that when we speak of the expenditure of Governments, we speak of that which is taken out of the earnings of the people; and there is hardly any country and hardly any period in which their earnings have extended to give to the labouring community a sufficiency — much less a general abundance—even of the prime necessaries of food, of clothing, and of fuel.” (William Gladstone, speech Gladstone gave in the House of Commons on 16 April 1863, quoted in Enderby 1872: 82–84). “The Income Tax, at 7d. in the pound, in the year 1842 3, attaching to Great Britain only, and in Great Britain only to incomes of £150 and upwards, was assessed upon an aggregate amount of income in the schedules I have named reaching £156,000,000. Upon the very same area, with the same limitations, in 1860–1 the amount of assessed income was £221,000,000. Further, I am not aware that there has been any change in the machinery of the tax, or any improvement in the powers of levying the tax, as compared with the powers of escaping it, that will in any way account for the difference. On the contrary, certain concessions and relaxations have from time to time been enacted by the Legislature, which, as far as they go, would rather tell in the opposite direction. The difference, however, amounts to no less than £65,000,000 of annual income, or two sevenths of the whole annual taxable income of the country within the area described. That is a most remarkable result; but there is a certain feature of that result which, when carefully examined, is yet more remarkable; and that is the accelerated rate of increase in the latter portion of that period. I again invite the attention of the Committee for a few minutes. I compare two periods—one of them before 1853, and the other since 1853, the year when the basis was altered. In ten years from 1842 to 1852 inclusive, the taxable income of the country, as nearly as we can make out, increased by 6 per cent; but in eight years, from 1853 to 1861, the income of the country again increased upon the basis taken by 20 per cent. That is a fact so singular and striking as to seem almost incredible. [Sir John Pakington: Australia!] Australia! Oh, no; I must not at this hour offer to the Committee a dissertation on the true effect of the discoveries of gold; but in passing I may say I grieve to see that in regard to that matter my right hon Friend is evidently lost in the depths of heresy. If I may presume, Sir, to refer to the causes of this vast increase of wealth, I would suggest two in particular. First of all the enormous, constant, rapid, and diversified development of mechanical power, and the consequent saving of labour in so many forms, and to so vast an extent, by the extension of machinery; in this, I of course include the modern means of locomotion. But the extension of machinery by steam power and otherwise has, speaking generally, been in active operation, together with the economy of labour it begets, for the last hundred years. There is another cause which has been actively at work during the lifetime of our generation, and which especially belongs to the history of the last twenty years. I mean the wise legislation of Parliament, which has sought for every opportunity of abolishing restrictions upon the application of capital, and the exercise of industry and skill; and has made it a capital object of its policy to give full and free scope to the energies of the British nation. To this special cause appears especially to belong most of what is peculiar in the experience of the period I have named, so far as regards the increase of the national wealth. Gladstone, William Ewart. “The Budget – Financial Statement,” April 16, 1863, in Hansard’s Parliamentary Debates, Third Series (vol. 170, March to May 1863). Cornelius Buck, London. 243–245. First, one should note that at this time the British income tax only taxed people with incomes of £150 pounds and above, and that those earning less than this did not pay income tax. Marx selectively quoted Gladstone and suppressed parts of the passages in yellow highlighting, because they showed that Gladstone did think that the working classes had seen their real wages substantially improve. So the proper sense of what Gladstone said is different from the sense of the brief quotation Marx provides in Capital. 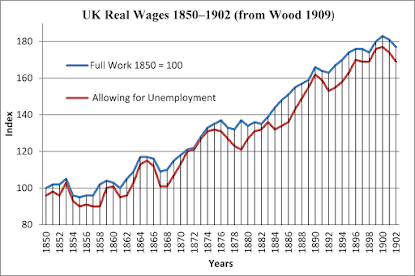 All the data we have now shows that Gladstone was correct in his belief that real wages were rising for the workers. 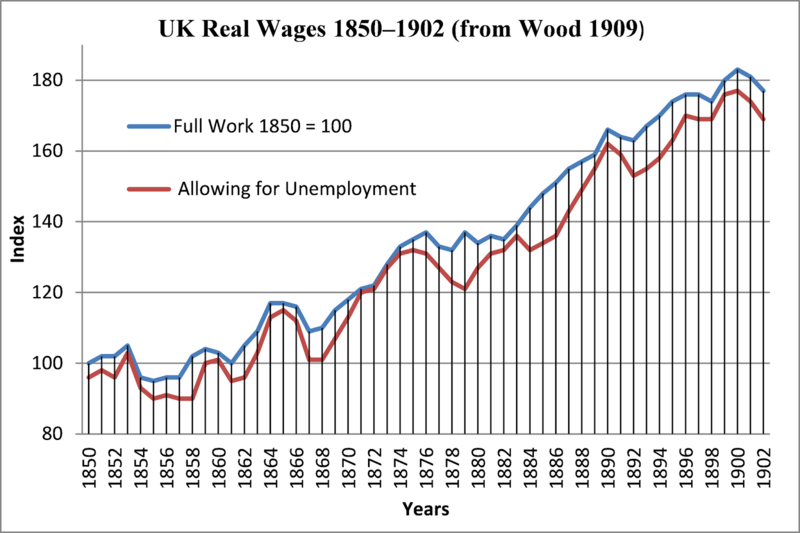 The data from Wood (1909: 102–103, Appendix) on UK real wages from 1850 to 1902, constructed from the wage data for working people in a whole range of industries, which can be seen in the graph below. As we see, there was a soaring real wage and living standards for working people in England. The rising real wage trend began in the 1840s and even in 1863 was visible, and can also be seen here. But Marx could have none of this, because it discredited his tendentious communist propaganda that real wages in capitalism have a tendency to be held down to the subsistence level. All Marx could do was to attack the idea that relative inequality had fallen, and ignore the evidence of the rising real wage, which badly contradicted his theory. Marx was attacked by Lujo Brentano (1844–1931) in the German publication Concordia (Brentano 1872) for his dishonesty and a debate ensued with Marx (Marx 1872a; Brentano 1872b; Marx 1872b; Brentano 1872c), and Engels in 1890 even attempted a defence of Marx in the preface to the 4th edition of Capital (Marx 1990: 115–119) on this very issue, but Engels simply evaded the most serious charge: that Marx deliberatively omitted Gladstone’s actual opinion of the improvement in the living standards of the working class. Marx was even more dishonest in his selective quotation from Gladstone’s speech in his Inaugural Address of the International Working Men’s Association of the First International which he had delivered in 1864 (which can be read here). If one examined Capital carefully, one could find many examples of Marx’s selective and dishonest quotation, mishandling of his sources and suppression of evidence that contradicted his theory. And this was well known and proved even in the Victorian age. For example, Joseph Robson Tanner and F. S. Carey – two scholars at Cambridge University – were interested in some of Marx’s facts in volume 1 of Capital and his sources. They concluded that Marx’s use of the official British government reports called the “Blue Books” in chapter 15 – just one chapter! – were marked by incredible misquotation, misrepresentation, and omission of contradictory evidence. Even worse, Marx was guilty of “an almost criminal recklessness in the use of authorities” (quoted in Page 1987: 48). In 1890, Engels stated that he only “heard of only one case, in which the genuineness of a quotation by Marx was questioned” (Marx 1906: 33–34), namely, the Gladstone case, but had he only read Tanner and Carey’s paper of 1885 he could have easily found numerous other examples. Brentano, Lujo. 1872a. “Wie Karl Marx zitiert” [How Karl Marx Quotes], Concordia no. 10 (7th March). Brentano, Lujo. 1872b. [Retort by Brentano to Marx], Concordia no. 27 (July 4). Brentano, Lujo. 1872c. [More on the Character of Karl Marx], Concordia no. 54, (August 22). Brentano, Lujo. 1890. Meine Polemik mit Karl Marx. Zugleich em Beitrag zur Frage des Fortschritts der Arbeiterkiasse und seiner Ursachen. Berlin. Enderby, Charles. 1872. A Treatise on Capital, Money, and Riches. E. Wilson, London. Marx, Karl. 1872a. [Karl Marx’s first reply to Brentano], Der Volksstaat no. 44 (June 1). Marx, Karl. 1872b. [Marx’s Second Reply to Brentano], Der Volksstaat no. 55 (August 7, 1872). Tanner, J. R. and F. S. Carey. 1885. Comments on the use of the Blue Books made by Karl Marx in Chapter XV of Capital. Cambridge Economic Club, May Term 1885.